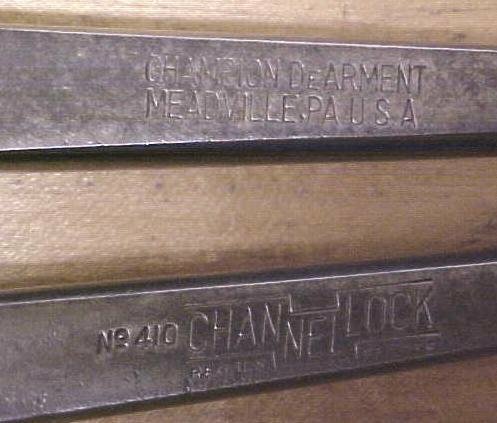 This is a unique style, heavy duty slip joint Channellock pliers marked "CHAMPION DEARMENT MEADVILLE PA. U.S.A. CHANNELLOCK NO. 410 REG. U.S. PAT. OFF". They measure 9.5" long and are very heavy duty with jaw width of .45". Lots of very good jaw teeth, shaped somewhat like a pipe wrench. They have about a .75" capacity between the jaws. The handles are plain, no cast grip patterns on them. Overall in very good condition with the exception of some very minor pitting in a few small areas noted. No rust or damage to report. Top quality, heavy duty, vintage pliers! 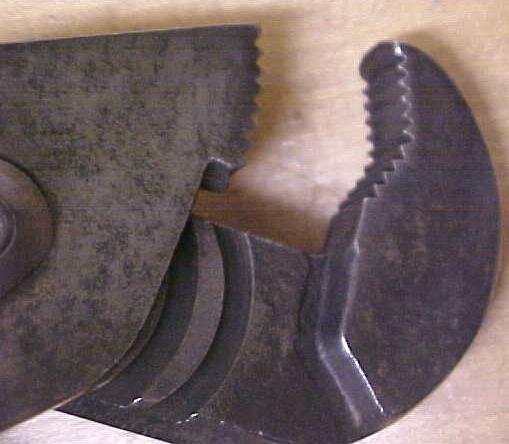 Items Similar To "Channellock Pliers Slip Joint Champion Dearment No. 410"